This past month, I read 4 books and listened to 2 audiobooks. I found this audiobook totally by chance: another library user had left the catalog open to this item. It sound interesting and the person had not checked it out, so I did! It’s part of the Modern Scholar Series, an interesting series of lectures on all kinds of topics, by excellent teachers. This teacher focuses on Balzac, Flaubert, Proust, and Camus. She highlights what’s specific to that author, presents some of his major works, and draws interesting parallels between these 4 novelists. I have to say, though I read and studied most of the works presented here many years ago, these classes were better than most of the classes I received by French teachers back in France! This book was one most fascinating. She came to spend 10 months in Chicago, as her husband was working on a big fountain for the Exposition. She goes everywhere, looks at everything, and has funny and to the point comments between American and French life style and characters of the time. This fascinating account of a French woman’s impressions of America in the late nineteenth century reveals an unusual cross-cultural journey through fin de siècle Paris, Chicago, and New York. Madame Leon Grandin’s travels and extended stay in Chicago in 1893 were the result of her husband’s collaboration on the fountain sculpture for the World’s Columbian Exposition. Initially impressed with the city’s fast pace and architectural grandeur, Grandin’s attentions were soon drawn to its social and cultural customs, reflected as observations in her writing. During a ten-month interval as a resident, she was intrigued by the interactions between men and women, mothers and their children, teachers and students, and other human relationships, especially noting the comparative social freedoms of American women. After this interval of acclimatization, the young Parisian socialite had begun to view her own culture and its less liberated mores with considerable doubt. “I had tasted the fruit of independence, of intelligent activity, and was revolted at the idea of assuming once again the passive and inferior role that awaited me!” she wrote. 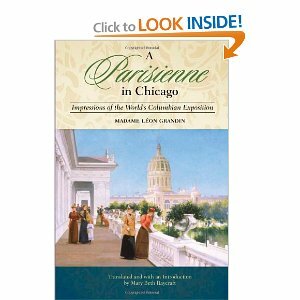 Grandin’s curiosity and interior access to Chicago’s social and domestic spaces produced an unusual travel narrative that goes beyond the usual tourist reactions and provides a valuable resource for readers interested in late nineteenth-century America, Chicago, and social commentary. Significantly, her feminine views on American life are in marked contrast to parallel reflections on the culture by male visitors from abroad. It is precisely the dual narrative of this text–the simultaneous recounting of a foreigner’s impressions, and the consequent questioning of her own cultural certainties–that make her book unique. This translation includes an introductory essay by Arnold Lewis that situates Grandin’s account in the larger context of European visitors to Chicago in the 1890s. Another very interesting book, found on the month display of weird things at my public library. Few lives are as sadly instructive as that of the dreamer who, by reaching for the stars, falls crashing to earth. Such is the tale of a 17th-century Swedish polymath and gifted eccentric, Olof Rudbeck. Univeristy of Kentucky historian King relates how Rudbeck, trained in his youth as physician (he discovered the lymphatic glands), mastered fields as diverse as architecture, botany, shipbuilding, etymology, musical composition and mythology, among others. It was an ancient Norse saga that set him on the path to what he believed would lead to his greatest triumph. Enchanted by circumstantial evidence and supported by his own breathtakingly inventive archeological and etymological research, Rudbeck in 1679 astonished his Uppsala University colleagues with the announcement that he had discovered Atlantis—in Old Uppsala. Fiercely disputatious and uncompromising when it came to his own genius, Rudbeck had previously poisonously offended many influential colleagues; his work was ridiculed and he died in obscurity. King is marvelous at elaborating Rudbeck’s theories and his heroic defense against charges of forgery and “foul-ugly fraud.” One wishes, however, that King had dealt definitely with the forgery charges. His trust in his own subject despite the evidence is honorable but perhaps misplaced. Still, King tells his tale with the pace and appeal of a classic whodunit. 20 b&w illus. Agent, Suzanne Gluck. (June 14) –This text refers to the Hardcover edition. This year for Great Lent, I asked my husband to pick up a book for me to read, and this is the one he chose. It’s an excellent ook, presenting all facets of prayer, with lots of excerpts of the Fathers at the end of each section. I loved it a lot, and copied lots of excerpts in my blog, you can find the posts in the 2 previous months. Saints who experience the power of prayer say it gives them wings to fly: wings of elation from being in proximity with Jesus Christ and relief from the burden of a sinful conscience. Once engulfed in the grace of the Holy Spirit, the person in prayer experiences death to sin, resurrection in the Spirit, and mystical ascension to the Father. The visible touches the Invisible, and joy wells up in the human heart. This volume evolved experientially: the fruit of fifty-five years of solitude by a contemporary desert monk besieged by prayer. Father Matta’s prayer life initially was formed under the direction of the sayings of the Russian Fathers, and later expanded under the direction of other Fathers, both Eastern and Western. He spent whole nights in prayer, reciting one or two passages from these luminaries and begging these saints to enlighten his understanding. Father Matta discloses: Whenever physical hunger turned cruel against me, I found my gratification in prayer. Whenever the biting cold of winter was unkind to me, I found my warmth in prayer. Whenever people were harsh to me (and their harshness was severe indeed) I found my comfort in prayer. In short, prayer became my food and my drink, my outfit and my armor, whether by night or by day. Father Matta El-Maskeen (Matthew the Poor) is a monk in the Monastery of St Macarius the Great, Wadi El-Natroun, Egypt. This is my 2nd or 3rd audiobook by P. Gregory. I thought I would read the whole series, but this time I have enough. It’s basically always the same thing, same style. As youngest daughter to the Spanish monarchs and crusaders King Ferdinand and Queen Isabella, Catalina, princess of Wales and of Spain, was promised to the English Prince Arthur when she was three. She leaves Spain at 15 to fulfill her destiny as queen of England, where she finds true love with Arthur (after some initial sourness) as they plot the future of their kingdom together. Arthur dies young, however, leaving Catalina a widow and ineligible for the throne. Before his death, he extracts a promise from his wife to marry his younger brother Henry in order to become queen anyway, have children and rule as they had planned, a situation that can only be if Catalina denies that Arthur was ever her lover. Gregory’s latest (after Earthly Joys) compellingly dramatizes how Catalina uses her faith, her cunning and her utter belief in destiny to reclaim her rightful title. By alternating tight third-person narration with Catalina’s unguarded thoughts and gripping dialogue, the author presents a thorough, sympathetic portrait of her heroine and her transformation into Queen Katherine. Gregory’s skill for creating suspense pulls the reader along despite the historical novel’s foregone conclusion. Here is another series I started some time ago. Also historical novel, this time on the Middle Ages, but at such a better level than Gregory’s books. Sharan, whom I met at Kalamazoo Medieval International Conference, does really her homework about theological debates of the time. I was very disappointed when I finished the last book in the Brother Cadfael series, but this one is a very good replacement, with Sr Catherine. Countess Alys of Tonnerre, victim of a brutal beating, is barely alive when her husband Raynald brings her to the Abbess Heloise at the convent of the Paraclete in medieval France. Young Catherine LeVendeur, who helps care for Alys, is disturbed by scars that attest to the woman’s prior mistreatment. Upon the Countess’s death, the Paraclete inherits a small piece of unimpressive land, which sets off a furor: Raynald claims the convent stole the property, and the prior of a nearby monastery makes a handsome offer for it. Catherine maintains her intense curiosity about Alys’s unhappy end even through the arrival of her betrothed, Edgar of Wedderlie, with Peter Abelard; after Catherine and Edgar’s wedding, the pair travel to Troyes and, at Heloise’s request, search for information on the mysterious bequest. Catherine soons stumbles on another mystery: the discovery of a headless corpse that may ignite the anti-Semitism that is running high during this Easter season of A.D. 1140. With this meticulously prepared work, Newman ( Death Comes as Epiph any ) adroitly crafts a puzzle in which the intriguing medieval material, providing much more than mere background, informs the entire novel with a vivid sense of past and guides the responses of the engaging, lively cast. Copyright 1994 Reed Business Information, Inc. –This text refers to an out of print or unavailable edition of this title. Fresh from her sleuthing in Death Comes As Epiphany (1993), 12th-century novice nun Catherine LeVendeur will leave the convent of Abbess H‚lo‹se and marry Edgar, student of the now frail Peter Abelard. The pair will take on dangers with derring-do to solve the curious murder of a young countess named Alys, whose death has something to do with property bequeathed to the convent and the tangled fortunes of a particularly nasty family. Among the puzzlements: Alys’s sister, a silent nun presumed dead to the world, and her bitter secret; the death and dismemberment of a mild gossip; an assault on a convent nun; the tangled motives of the dead countess’s horrid mother, who has lethal plans for snooping Catherine. Throughout, there are congenial chats with kin, the like-minded, and the high-minded. Catherine’s father, a “Jewish apostate,” has ongoing problems, as does the beleaguered Abelard, headed for condemnation by the Council of Sens. With richly satisfying settings, this smooth mystery is tight as a tambour. Top-notch sleuthing, classy with Latin saws and observations.